We offer the answer that Prometheus set out to answer when the film was being pitched: just how big is Michael Fassbender’s bratwurtz? I was hoping you guys might have discussed the film from the point of view that Shaw is most likely wrong. She was correct that extra terrestrials visited Earth, but almost everything else she concludes is flimsy and contradicted or else has a more obvious explanation. Look at some things in the movie that none of the crew of this Ship Of Fools comments on. There’s no reason to assume that the star map was an invitation to future generations rather than a map drawn by human witnesses, who saw ‘Engineers’ displaying where they would bring humans. There’s no reason to assume that the crew of the Prometheus are the first humans to land on LV-223 – although it’s likely that they are the first humans to go in their own ship. The Engineers we see in the hologram are all wearing helmets inside the Dome, and the Engineer who runs after Shaw -from his ship to the lifeboat – is not wearing a helmet despite the poisonous atmosphere, and yet he doesn’t seem anyway weakened when he gets to the lifeboat and rips open the doors. Why bother then having a sealed connection with clean air directly from the ship to the tunnel that leads to the Dome complex? So, if they can breathe the local atmosphere, and if the wear helmets in the dome anyway, then why didn’t anyone consider that the super clean atmosphere was to prevent the human cargo from passing out and dying the minute the ships dock and open the door? Also the spacing and height of the cylinders in the ‘temple/sacrifice chamber’ are more appropriate to pre-industrial humans than to 8 or 9 ft ‘Engineers’. Also, Shaw says ‘Their DNA matches ours, but its older’ as proof that ‘Engineers’ created humans. That’s not at all conclusive. The relationship could be the other way around, that the Engineers were bred as giant albino workers using the DNA of ancient humans kidnapped and brought to LV-223 by a yet unseen character. The plot makes some hints at this, which the audience seems to have missed if they want everything explained in the dialogue. If this dome is some kind of ‘Dr. Frankenstein’s lab’ then the Engineer’s are Igor, not Dr. Frankenstein, and the black goo is what makes the monsters. There is a visual clue to this, when the Engineer head is reanimated with electricity. It’s also worth pointing out that anyone who has read Mary Shelley’s 1818 book ‘Frankenstein’ might have noticed the full title of that book is ‘Frankenstein – A Modern Prometheus’. While Shaw follows her pet beliefs and tries to support it by cherry picking, a more skeptical scientist would have considered the possibility of alien abduction, rather than assumed a creation story. Having started her reasoning in the book of Genesis, Shaw quickly leaps to the other end of the Bible to assume the apocalypse from Revelations. This is based in part on her religious beliefs and also on a vague statement from David. If you pay close attention to David’s dialogue, you’ll notice that he uses vague or double meaning statements when he wishes to mislead or insult people. (Presumably, he has some kind of programming against directly lying or insulting) . In the case of the Engineer’s mission, David never said ‘The Engineers will wipe out humanity’ , he said ‘sometimes in order to create, you have to destroy’. Notice how Shaw doesn’t asking him to clarify that, as she has already chosen to believe in a genocidal mission. However, that vague statement is also consistent with destroying a much smaller number of humans, brought from Earth, to LV 223, and made into bioweapons by using the black goo. While the audience might not have noticed all the detail in the film, from its own internal logic, Shaw, of all people should be skeptical of the notion that these Engineers wanted to wipe us all out 2,000 years ago. Sure, this mission got delayed by some kind of accident, but from the dates of the cave paintings there were at least 2 more visits to Earth about 1400 years prior to the setting of the movie, and humanity was not wiped out. It’s worth noting that for the more recent cave paintings, there were already other human civilisations that had writing, and had abandoned human sacrifice – but these Engineers chose to visit the cultures that were still tribal, illiterate and practising human sacrifice. So perhaps the Engineers mission was routine, go fetch more bodies for the lab – the hi-tech equivalent of sending Igor out to the graveyard with a shovel. For all we know those silver containers in the ships hold contain the power source for the ship’s propulsion systems. If Shaw has indeed leapt to unfounded conclusions, then the end of the movie is tragically comic. She’s out to track down a bunch of kidnapping, DNA-tampering, warmongers, in order to ask them theological and philosophical questions. Hello and welcome! Thanks for listening and taking the time to comment over here. I think we’ve met on youtube before, but I could be mistaken. Some of these comments look familiar! I have to tell you there are some killer observations here. I never considered the possibility that Shaw was the unreliable narrator, because my assumption was that the audience was just suppose to accept her crazy theory as the reason to go explore and thus have a movie. It never occurred to me that she was wrong (but most audience members probably didn’t assume she was right either), but I assumed we were going with the common science fiction trope: go out into space with the intent on discovery only to find something terrible that wants you dead. The looming idea that I was watching an Alien prequel also colored my expectations a bit. But there is one thing I did know and that was that I knew we weren’t going to be watching a diplomatic mission on an episode on Star Trek TNG. As far as to the origin and motive of the Engineers I suppose one could theorize many different possibilities. You could brainstorm this for hours (especially considering that so much is unanswered), and probably come up with a bunch of cool explanations or at the least ideas of what may have occurred. There is so much to look into when so much is left unturned. The main problem with this film isn’t in the missed nuances of dialogue or the lofty thought-provoking concepts, but in the execution of motion picture basics. Who is the story about and why do we care? 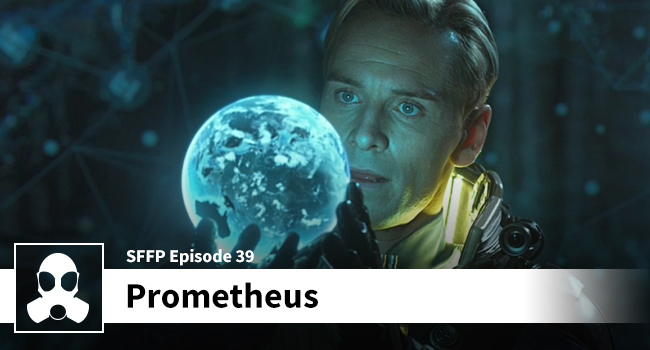 Prometheus was more like — here is WHAT the story is about, kind of, and we aren’t sure why you will care, because the characters will not be developed enough to capture our hearts. And I think that was the biggest concern for me. I cared so little for the characters that the story started to become meaningless. I think that plot is irrelevant if I don’t care about the characters. There is no personality. Nothing tangible for me to latch on to. I am excited about the sequel though, because of course, there is plenty of possibilities (like your post suggests) and I really look forward to what direction they go. I think it would be cool if the Engineer on LV-426 was actually Shaw in one of those exo-suits. Indeed, we did have an exchange of comments in YouTube. The skit is the comment under the review. I’ll check it out as well as your blog. Thanks again for listening and posting.